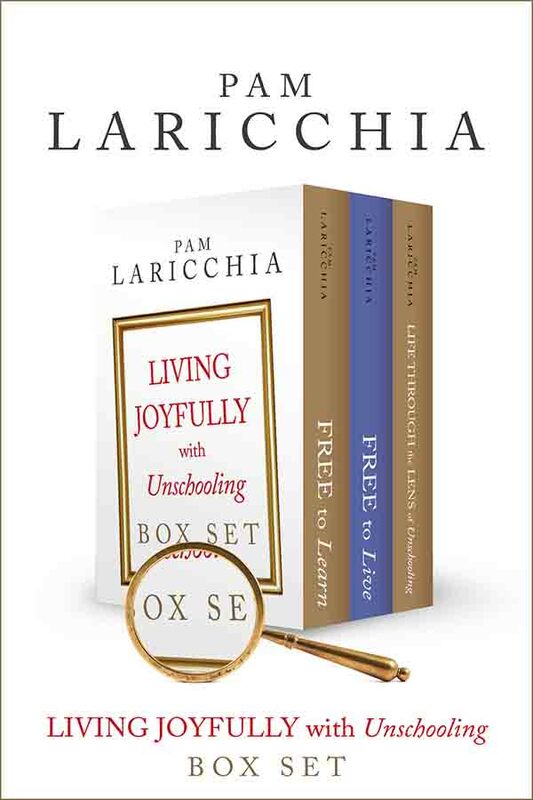 PAM: Hi everyone, I’m Pam Laricchia from livingjoyfully.ca and today I am here with Nick Hess. Hi Nick! NICK: Hi, how are you? PAM: I’m good, thank you. If people don’t know, Nick is an unschooling dad with five children, and I said that because you may know him online as The Unschool Dad. He has an active Facebook page and he is on Instagram as well and it is always fun to catch all of the interesting pictures and quotes and stuff that he shares. Can you share with us a bit about you and your family? NICK: Sure, I have been married to my wife for almost twenty years. We have five kids as you said, and my oldest is seventeen, Rosie, Isabella is thirteen, Nick Jr. who is eleven, Evangeline is nine, and Joshua, who is six. PAM: I would imagine that turns into a lot of fun, right? PAM: Speaking of which, I do love hearing what unschooling kids are up to; it is always fun to see the kind of things that they are exploring. I was hoping you might share what your kids are interested in right now. NICK: Sure, it is mainly a lot of art in our house. I will start with my oldest daughter, Rosie, who is an active artist. 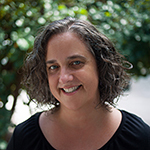 A couple of years ago she was an illustrator for a children’s unschooling book, it is called, Bubbles and Puddles: Our Unschooling Adventure, by Kristie Howe. She drew all of the illustrations for the book and she just loves to draw. She was the first one who started drawing and it really led to the other ones sparking their interest in drawing. My second daughter is a self-taught whale artist. Isabella draws orcas and all kinds of marine mammal life. It is just amazing; some of her pictures look like photos. NICK: It is pretty amazing. We just got back from California, actually. We took her to see some live dolphins off the coast. Hopefully she will get some inspiration from that. Then my third son, Nick Jr., he is a chef; he loves to cook. I share his pictures as well, this kid could out-cook all of the adults I know. He makes everything from scratch and he is very passionate about it, that is one thing that he just loves to do. Most kids want toys and things like that, and he wants kitchen utensils. Evangeline is another little artist. What is cool is that she started younger than my first two and she has her older sisters to help her out, so I am really excited to see what her drawings are going to look like as she progresses. She likes to draw a lot of original characters and things like that. My fifth, Joshua, is a video game addict; he loves the challenge of video games, he is very competitive, whoever plays with him knows that he is going to be very competitive; he loves to win. He loves Epic Mickey 2 right now, he can play that game over and over again. PAM: That is awesome. I remember trying the first Epic Mickey, that was really hard for me. NICK: He will watch YouTube tutorials, and he works through that, before even six years old. PAM: That is awesome. I love hearing what they are interested in because they just throw themselves into it! It’s not like “That’s my kids interest.” No, they are just human beings throwing themselves into whatever it is. It is just so fun to watch them, isn’t? NICK: It is just their passion and it is just like, you see it—the freedom they have. They could be in school all day but why when they could be really learning their passion with things that really excite their soul and the freedom of being a human being just to do what you want, uninhibited. It is amazing, it is truly magical to watch and I am truly honoured as a father that I am able to see it in my children. PAM: I know, that is awesome. I was hoping you could share with us what your family’s move to unschooling looked like. NICK: Well actually, it is a pretty interesting journey. I actually started when I was very young, I was in public school, and I was born and raised in Las Angeles, so I was in the California education system. I really disliked school. I was never bullied or anything, I had friends, I grew up with all the kids on my block. I had great friends, there was no problem with that, it just was boring to me, it was just a complete, utter bore. I knew there was always something better for me. So, they took me out, but they did not register me in the new school, so I truly experienced what it was like to be living life without school, and it was amazing. So, from being very small in the fourth grade to realize what school was…we came back and they put me in, they put me right where I had left off, they did not tell me anything, they just put me back in the class like nothing ever happened. That really impacted me young; what the true meaning of school was and from then on it just really resonated with me what the school system was about. PAM: So, have any of your children been to school at all? When we first started, we knew we were going to homeschool from the beginning, but we put the oldest in a homeschool program—a charter school that gave us a curriculum. The whole thing with that was that she was in kindergarten and the California state testing came along and she was fearful of the test and we told her, “We do not care what you score, you could write anything,” but the fear that kept coming across really made us think and realize what it was about. During a homeschool group, someone introduced my wife to Thomas Jefferson Education, a book, and from that, she read a John Holt book, and just realized there was so much more out there than the schooling system. PAM: That is really cool. What were the pieces that resonated with you as she was reading John Holt and bringing those ideas into your lives? What were the pieces that helped you feel really confident about moving to unschooling? NICK: Like I said, a lot with my own personal experience, and especially in high school. My parents were very supportive of me and in high school I still had the same feelings of not wanting to be there, so I started ditching. I lived in LA, I had a bus pass that would take me anywhere in LA County, so I would take off. My parents didn’t know at first and I would go to the Tonight Show. There was only one time I got stuck in downtown LA at 11:00 at night and I had to call my parents and tell them because they thought I was at a friends’ house. I am very grateful to my parents; they did not get mad, I had to wait for my dad to get off work and come and get me, but my parents always respected that. They always saw and knew that I was different, that it was a different journey for me, so I was really thankful that my parents were really respectful of me for that. They let me drop out of my senior year. At the time I had no idea, but my dad got a job transfer to Honolulu. I was going to go register for high school but I did not really want to, I would rather explore Hawaii, and so it was really cool that they did not force me to go. I would surf and they let me get a job, so I got a job in my senior year of high school and I started exploring Hawaii and their culture, and it was really true life experience. So, when it came to learning about John Holt and I mean, that man is amazing, just everything about what he writes really resonated with everything that we wanted for our children. NICK: Yeah. At first I thought, this kid would be in school and here I am, a high school drop out, and that there is a piece of a light bulb, there is so much once you realize and you see what life is about, a light bulb goes off and then you can’t look back. 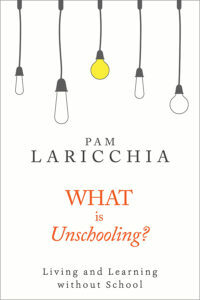 I do not question unschooling. I can’t think of any other way as our family grows and everything about it encompasses our daily lives—it is just amazing. PAM: And does that help you look back more positively too, on that high school time and your parents being ok with you exploring Hawaii, for example, instead of finishing high school and you getting a job and that kind of stuff? Do you look more positively on that now? NICK: Definitely. There is the whole self-education movement and it has never stopped me from being who I wanted to be, and it is like many people say that you need to have a diploma, you need to have a degree, you need to have so many things in life to be successful, but to be honest, it has never stopped one thing I wanted in life. That degree or a job I needed, or my business; it has never been in the way. Actually being able to teach myself along the way has helped me more than I think school ever did for me. PAM: That makes a lot of sense. 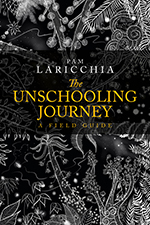 So then, what for you was the most challenging aspect of moving to unschooling? I think that was a challenge because you are just constantly having a Facebook post trigger somebody, and it is like, your cousin’s daughter is a teacher and she wants to fight with you. So, I think that was the biggest part, and as the years go by when people try to ask me or pick their unschooling fights, I am over it. If people get it, they get it, if they don’t, they don’t. I mean, I can talk to them. So many people are just like, “How dare you? Kids need school,” and it is just like, I am at this point where I see it in my own life, I see it in my children’s lives, I see the incredible things my children do, it is just the family…it is hard because sometimes people are close to the family and it is just like when you finally get over caring what they think anymore and it is just like, “Hey we know what we are doing, at the end, you will see our kids flourish and everything,” and I think that is the whole point. I think the family was probably the hardest, the most challenging aspect of it overall, all those years ago when we started. PAM: Did you find yourself, when you were first starting, kind of pulling away for awhile because you found that it was conflicting? I know for us, for awhile that first year we did less family occasions because they were so confrontational because it was new to them. They felt they could change our mind and I was still learning and getting comfortable, because I didn’t have experience yet. I hadn’t spent a year or two seeing my kids unschooling and knowing in my bones that this was awesome. We were just trying it out, so that was one of the things that helped us, did you find that as well? NICK: I think one of the biggest things that was really helpful is that we moved from California and all of both sides of our families are in California. So basically, we only see them a couple of times a year so that daily thing, besides the Facebook posts, was really moving away to really be us, and really be who we are. My parents have always been supportive of it and they moved to Arizona with us, and the whole support of that with us, my wife and us as a team, as a family, I think helped and that whole move really helped a lot where it was not this bombardment of it every day. PAM: What was behind the move, was that something that just happened coincidentally? PAM: It was a coincidence? NICK: It was a coincidence. In our business we sell at fairs and festivals, and we were doing a couple of events in Arizona and just the cost of living in Arizona was much cheaper than California at the time. It was about 10 years ago, before the whole collapse of the economy and housing and everything here was just so much cheaper. It just so happened that at that ten-year mark, when the whole school thing was happening with my daughter, we were leaving and we moved here and that is when we really started our journey without school. PAM: That is really interesting; that is cool how it worked out. 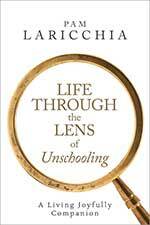 What has surprised you most so far about how unschooling has unfolded in your lives? NICK: The most surprising thing would be how children teach us. At first, I did not realize, when you are open and you have an open relationship with your children and you have a good relationship with your children, and you are your children’s friends—I mean, our children are our best friends—they truly teach you about everything. There are some things that my son will come up to me and talk to me about something in World War II and he is only 11 and it’s like, “Oh wow, thank you for that information.” The knowledge they have, overall it is just amazing; just the facts and the things that they know. Truly I don’t believe that if my children were in school … the art, the creativity they have, I think it would be stifled. Because they would have to come home and do homework and then we would have to constantly be on them. The whole thing just allows them to be creative and let everything flow; just natural living. PAM: I love that idea of flow, that is something that I was totally surprised by. Because before that, so much of our day is scheduled and organized and you think that being hands off and not having that schedule, you just kind of assume you will just sit around and do nothing unless we plan it, but that is so wrong. PAM: And you are right about how much they teach us, because once you are on equal footing as people, as human beings, and everybody is just sharing what they find interesting with each other, it is amazing all of the bits and pieces that they pick up and it is so lovely when you can say, “Thank you, I didn’t know that.” And that happens so often, doesn’t it? NICK: Every day. 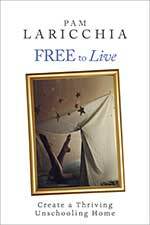 Every day is something new, every day is truly about freedom to allow them to access things. To really access technology, to access the information on the internet. My younger kids; the little ones do not know how to read but they can talk to google and ask the little tablet anything they want in the world and that information is at your finger tips. That is the amazing part, when they are curious about something like the election, we don’t really talk about politics, but they will come up to us and talk about politics or just a million things that you would not even think little kids would talk about, but that freedom and that flow is just so magical. Kids are interested in things, they are interested in the world, they are interested about a lot of things, and when you give them that freedom to explore the world, what it truly is, they explore and they learn and it is truly magical. PAM: I love that word, magical, because it does seem like that, doesn’t it? I mentioned earlier that you post regularly on Facebook and Instagram as ‘The Unschool Dad’ and you share a lot of great inspirational quotes as well as pictures from your unschooling lives. I really enjoy following you guys so I would love to know, what inspired you to start that project? NICK: Actually, that was kind of a mistake. I just created the account one day, ‘The Unschool Dad,’ to share memes I liked, or quotes I liked off the internet, so I would not hurt people; I was tired of arguing with people, like I said. Somehow one meme got shared and went viral and, all of a sudden, I had 1,000 followers and then 2,000 followers and now I have almost 47,000 followers and it is just word of mouth, I have never put anything into it. I would like to blog, but I do not really have the time. Probably eventually I will start blogging, to share our experiences as a family, but it is just really cool how it has grown. Sometimes it is hard work to really keep up with it, but the messages I get, “Oh, thank you for showing us that this could be done,” that inspires me to do more to show people there is really another way, to give your children freedom, and I get more positive reactions. Like I said, I get pissed off at the teachers every once in awhile, but it is more positive than anything, just really helping families see another way to live their lives. 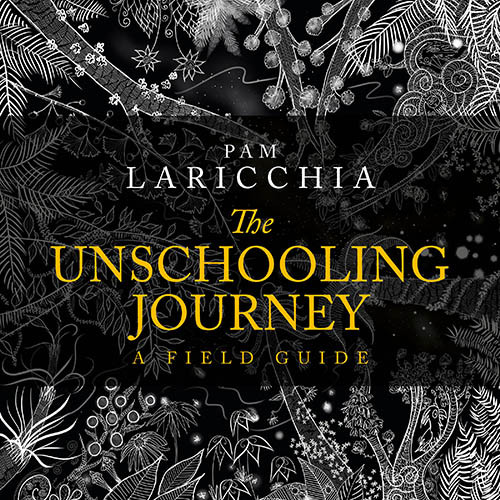 PAM: I love that it started because you were posting things on your personal page, right and that was sparking discussion so then when you made an unschooling focused one, you are more attracting people that are interested in that. That is brilliant. NICK: So once again, I like Instagram. It is more directed at people that want to follow you; it doesn’t show up in somebody else’s newsfeed, so that helps a lot. PAM: Very cool, and I loved your point about how sometimes that can be the first light bulb moment for someone, because those memes are like little seeds, aren’t they? They may just pass and pass and then they start to connect in the background for people and then they get more curious. I think it is lovely. NICK: Yeah, definitely. Even some people have been like, “Oh wow, I never thought of that.” When you incorporate this unschooling and attachment parenting and peaceful parenting and overall just truly respecting children. When they see a child for who they are, a human being, and that is what it really comes down to. We treat children like they are some kind of oddity, “Oh, you need to do this; for these 12 years you need to go to school and learn all of these things,” but truly, just for the human rights of a child, to see who they are, to really let them blossom, is magical. PAM: That is so true. I mean, because we start with unschooling, but quickly we get to the foundation, like what simmers underneath that. Unschooling is built on these relationships with our children, and that is human—even if school has to be in the picture, you can still have respectful, trusting, loving human being based relationship with your child, right? NICK: Yes, definitely. At the beginning of this school year, my children were interested in this online school, my eleven-year-old and nine-year-old. So, they asked us, and we respected their decision and we enrolled them. One of them did not start it; my daughter did not start it, she said forget it, and my son did it for a week but could not stand it. I respected their decision to try it, and they tried it and now he knows that he didn’t like it, but he had the chance to do it and it was just so time consuming. There was a homeschool part with a curriculum where he had to sit there at least for 5 hours in front of the computer and did all their common core math and he realized what it was about and after a week he asked not to do it. It was truly amazing to let him make that decision about his schooling, not like “You have to do this.” At 10-11 years old that he knows he has the freedom to choose what he wants in life. My happiness comes from his happiness; what he wants to do. Really the pleasure of life is to see them happy. PAM: Yeah, for me that where my Living Joyfully website came from. Because you realize that when you are pursuing those things that get us excited, that bring us joy, that make us happy, where even the negative things that happen and everything—that is all life. Those are experiences that mean something to us because we are pursuing them from our own volition, because we are interested. When we are pursuing the things that are fascinating to us, that is when we just learn so much no matter what happens in the end, right? Like, for example, with reading. I think this is probably a lot of people—it is good that we do not live around family because I never forced my children to read and the desire came from playing video games to chat, it is truly magical. I think that the whole magical thing about unschooling is watching your child learn how to read naturally. And from being inspired from something they love, with my older two it was a big thing a couple of years ago. They had subscriptions but you had to chat with other people in the group and so they asked, “Hey, we want to read.” It is just truly magical; seeing their desire to learn. Most people are like, “Your kid is 10 and doesn’t know how to read yet,” but it seems like that is the age when my children really had the desire. We never had to force them, we just let it flow, and to see that flow of reading and see it naturally and from a passion, from their desires to learn how to read. They are so focused within the curriculum in schools to teach the skill because, ‘this is a skill that you will need,’ but when you have the patience to follow that flow, the need for those skills comes up in life, naturally, doesn’t it? And to see them hit that … for them, picking up that skill is not about the skill, it is about satisfying the need, and they will pick up that skill along the way. NICK: Yes, when you let it flow naturally, and just all of the things like math and all of the little things—I understand there are some children that pick up reading early, there are some children that want to read earlier—but when you see it and you let it flow through everything in life. For thousands of years, humans learned naturally. When you let it happen and you get there, and you do not force it, you are just there helping them. And I think that is the important part, is that you have to be there. I mean, me and my wife are constantly with our children. You have to be there to help them, and guide them, answer their questions, or help them spell something. And when you are there, and you are just part of your children’s lives, you just see it all. You come together and it is truly a magical lifestyle that we live, it is just amazing. NICK: Actually, we had a problem like that; that is a perfect example. We had a family member that came over and he has a college degree and he is into engineering and he got my son all of these different little engineering things and he told him (this was a couple of years ago), he said “I am not going to teach you because you can’t read.” We were flabbergasted. It was like, you missed a moment with this child that you could share all of your knowledge with, but you told him that because he cannot read you are not going to help him. And it was just amazing that people think this way. He could have probably learned way more by you sitting there explaining to him the things, because then you are applying it to something that he is excited about in his life, but instead choosing not to connect with him. It was just crazy to us to think that somebody would say that. PAM: Yeah, I know, it just makes no sense. Just because it is not something that comes up in our lives. Like you said, it was somebody from the outside coming in and sometimes it surprises you because it has been so long since you have seen that kind of approach or attitude towards kids, right? PAM: And our last question, Nick. As an unschooling dad, what piece of advice would you like to share with dads who are considering or just started out on this journey? NICK: I think the biggest thing and one of my favourite quotes by John Holt is to really trust children. “To trust children we must first learn to trust ourselves,” and, I think, just be open-minded, you know what I mean? And I know I see this question a lot in groups. I do not really participate in groups, but I see them, or some friend will send me a message, asking like “How do I convince my husband to unschool?” or “My mother in law does not get it.” And I think that the biggest part for dads is to really trust your children and just be open-minded; but a supporter, be a listener. I know sometimes dads go away for work and they are working a lot, so it is a lot of times the responsibility of the mom with the kids. Really listen to your spouse, your significant other on what is really going on. Be supportive. I mean, children are learning, when you give them that environment of freedom. So many times our society says, “Not this, not this.” We constantly want to restrict, restrict, but children are very good at self-regulating when you give them the freedom to be on the internet and explore what they want. Let them explore; our future is technology. Give them the freedom to be who they are, and I know many people, like my example, my passions, when you learn about your passions, you are learning about something new, you learn just like your children will learn. Just overall really trust, respect the child. Just respect and be supportive and unless there is some kind of developmental thing where your child is not learning, they will learn, they will get it as long as you are there, as long as one parent is there guiding them and directing them, they are learning and you are giving them that freedom to pursue what they want. They are going to learn. PAM: I love that; I think that open-mindedness is so important because it is such a big leap. It is so unconventional at first, isn’t it? But if you can have that open-mindedness and just hold that trust for awhile and let things flow, you will see for yourself; all of these things will happen, won’t they? NICK: Yes, definitely. Like I said, it is hard for some people to realize, like with that whole school thing, and then coming to something where you let children be free, it is a really hard decision, but it is really well worth it. It is really worth it just to see them and just to blossom into these amazing human beings, these amazing people. And another thing I think that dads do, they think they need to be this father figure and set these rules in their house. But free your children from arbitrary rules, and just be your children’s friend. I have amazing relationships with my children. Our teenagers are amazing human beings. You see people complain about their teenagers and it is just like, I cannot complain. We are really friends. They are amazing. When you give them freedom and you respect them, you have to be their friend and they will come to you. When my daughter has a problem, she comes to my wife or I, when she is sad. 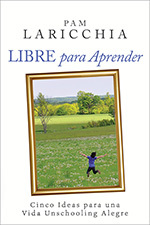 With any outside influence where they are bothered, they come to you, and that is the effect of unschooling I want, is that they come to us instead of finding some other kind of thing to fulfill their need. When they can know that they can come talk to us we can help them solve the problem or figure something out, and I think that is what the true experience is about. PAM: Yeah. They know that we have their backs, right? That they are not going to be judged, they are not going to be … punished. I could not think of the word! It has been a long time! But yeah, when you are on the same team, that does not mean that things are perfect or anything like that because stuff happens in life, things go wrong, but when they know you have their back, like you said, they are going to come to you. They know you have the experience, they know you love them, and they have this comfortable relationship with you to sort through things and to try to figure out a path forward, right? NICK: I think that is the biggest thing that made my public schooling tolerable was that I knew my parents had my back, like from being very little, I was the youngest; my brothers and sisters were older and had already moved out, and my mom always had my back. From when I was little, I remember being three or four, and we were somewhere and I was just looking at candy, and the lady said, “Don’t touch that,” and my mom immediately told that lady “Hey, don’t talk to my son like that.” So, from being very little, I knew my mom would stand up for me. Throughout my school when I knew something was wrong, no matter if I was right or the school was right or if I was wrong, I could go home to my mom and my mom would be right down at the school telling them where to put it. That is very important, especially because I grew up in the inner city of LA; there were a lot of gangs and things like that and I could have been influenced any way, but I knew my parents were very supportive of me. That is true that that is the most important key in all of it, just being there for them, and helping them through life so they know they can come to you and not go somewhere else. PAM: That is such a great point, Nick, and I think you are right; it boils down to that relationship in the end, doesn’t it? And that relationship lasts a lifetime, not just for the compulsory school years. You are building a life with them. NICK: Yeah, it is a lifestyle. 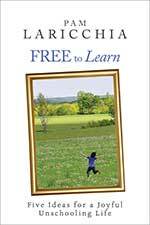 It is our whole life and a lot of people think this unschooling is an education method for your children, but it is not, it is life. Like my wife and I, when we first started going this way, it helped us question things in life. It made us better critical thinkers of so many other things in life, and we are learning and it is just amazing overall, the knowledge, and the things you start questioning over and over, and it is just like, it is a lifestyle. Everything encompasses your life; learning and growing, and questioning. It is just awesome. PAM: That’s right. It is awesome. Thank you so much for taking the time to speak with me today, Nick. I had so much fun, thank you! NICK: Thank you for having me. And for having me share. PAM: Yeah, I loved hearing a bit more about your story, that is great. And before we go, where is the best place for people to connect with you online if they would like to follow along as well? 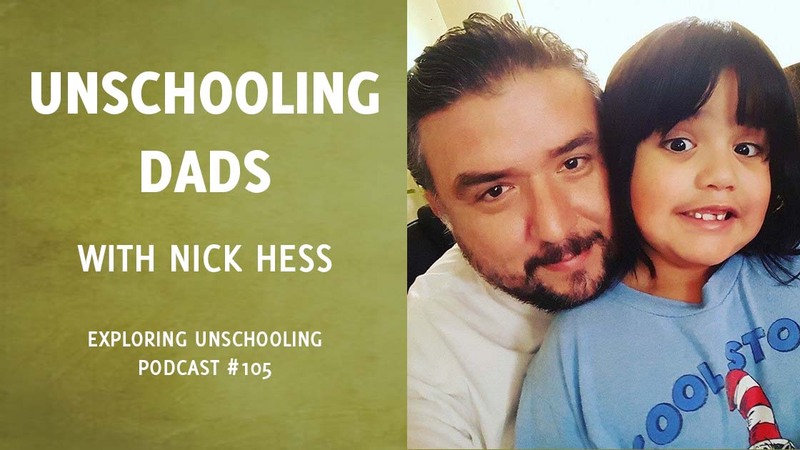 NICK: On Facebook, The Unschool Dad, or Instagram, at The Unschool Dad. PAM: Perfect, and I will share links to that in the show notes. Thank you so much, Nick, have a great day!